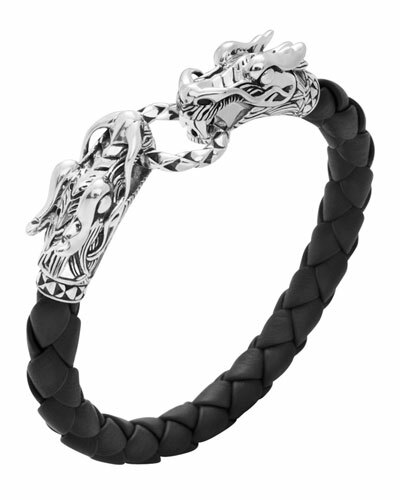 More Details John Hardy Naga Dragon Station Chain Bracelet Details From the Naga Collection. Sterling silver woven chain bracelet. 18-karat yellow gold eyes. Ring connects dragon head and tail. Push clasp. 7 1/2"L. Handcrafted in Bali. 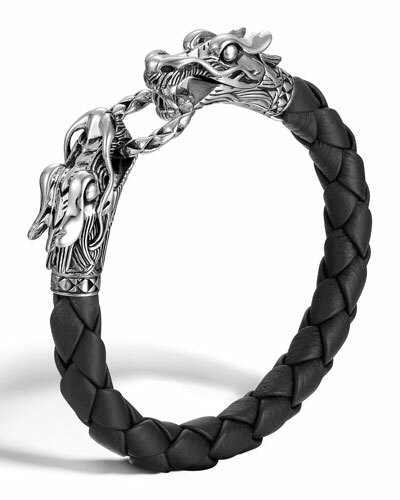 John Hardy Naga Dragon Station Chain Bracelet Details From the Naga Collection. Sterling silver woven chain bracelet. 18-karat yellow gold eyes. Ring connects dragon head and tail. Push clasp. 7 1/2"L. Handcrafted in Bali. More Details John Hardy Naga Silver Dragon-Head Bracelet Details From the John Hardy Naga Collection. 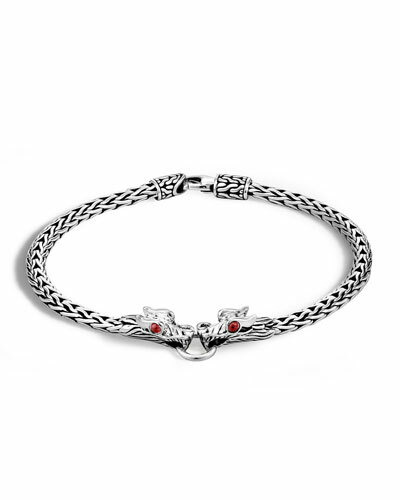 Sterling silver snake-chain bracelet. Interlocking dragon heads with ruby eyes. Approx. 7"L (18cm). Lobster clasp. Handcrafted in Bali. John Hardy Naga Silver Dragon-Head Bracelet Details From the John Hardy Naga Collection. Sterling silver snake-chain bracelet. Interlocking dragon heads with ruby eyes. Approx. 7"L (18cm). Lobster clasp. Handcrafted in Bali. More Details John Hardy Legends Naga 5mm Silver Bracelet w/ Blue Sapphires Details John Hardy bracelet from the Naga Collection. Signature sterling hardware with woven chain. 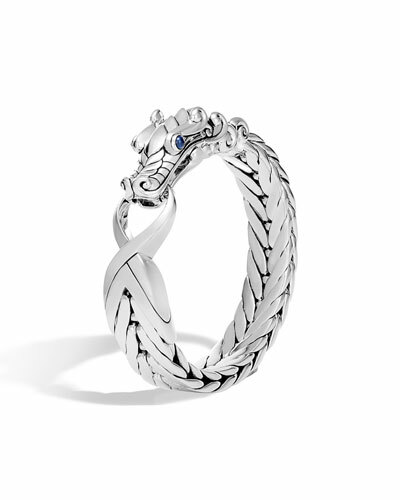 Naga dragon motif with blue sapphire pavé. Two round blue sapphires as eyes. Approx. 0.2"W. Two round blue sapphires as eyes. Puller clasp. Handcrafted in Thailand. John Hardy Legends Naga 5mm Silver Bracelet w/ Blue Sapphires Details John Hardy bracelet from the Naga Collection. Signature sterling hardware with woven chain. 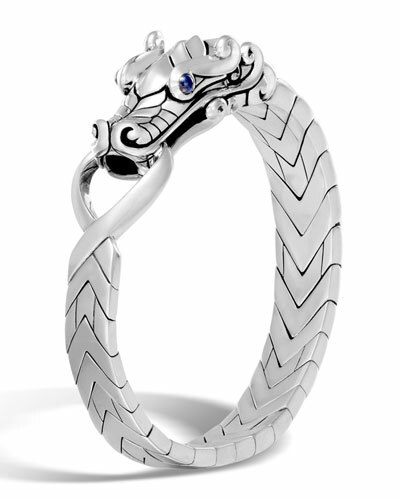 Naga dragon motif with blue sapphire pavé. Two round blue sapphires as eyes. Approx. 0.2"W. Two round blue sapphires as eyes. Puller clasp. Handcrafted in Thailand. More Details John Hardy Legends Naga Multi-Row Pearl Bracelet Details John Hardy bracelet from the Legends Collection. Sterling silver hardware and Naga dragon clasp. Woven strands of pearls and hematite beads. Naturally white freshwater cultured pearls. Two round blue sapphires as dragon eyes. Approx. 12mm wide. Puller clasp. Handcrafted in Thailand. John Hardy Legends Naga Multi-Row Pearl Bracelet Details John Hardy bracelet from the Legends Collection. Sterling silver hardware and Naga dragon clasp. Woven strands of pearls and hematite beads. Naturally white freshwater cultured pearls. Two round blue sapphires as dragon eyes. Approx. 12mm wide. Puller clasp. Handcrafted in Thailand. More Details John Hardy Legends Naga Bracelet w/ 18k Gold, Size M Details John Hardy bracelet from the Naga Collection. Signature sterling hardware with woven chain. 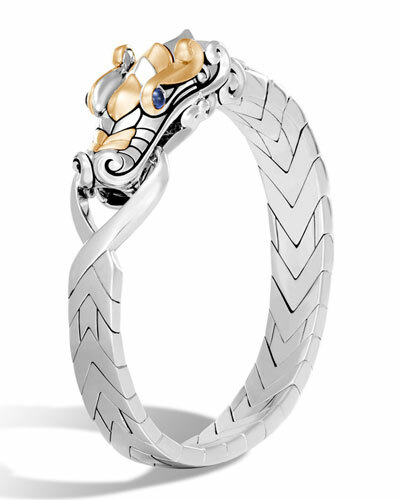 Naga dragon motif with 18-karat yellow gold. Black rhodium with blue sapphires as eyes. Puller clasp. Handcrafted in Thailand. John Hardy Legends Naga Bracelet w/ 18k Gold, Size M Details John Hardy bracelet from the Naga Collection. Signature sterling hardware with woven chain. 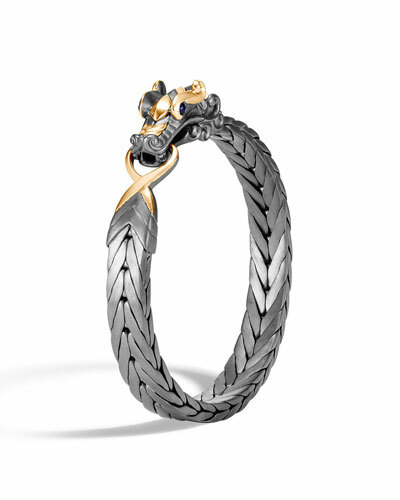 Naga dragon motif with 18-karat yellow gold. Black rhodium with blue sapphires as eyes. Puller clasp. Handcrafted in Thailand. More Details John Hardy Legends Naga Bracelet w/ Diamonds, Size L Details John Hardy bracelet from the Naga Collection. Signature sterling hardware with woven chain. 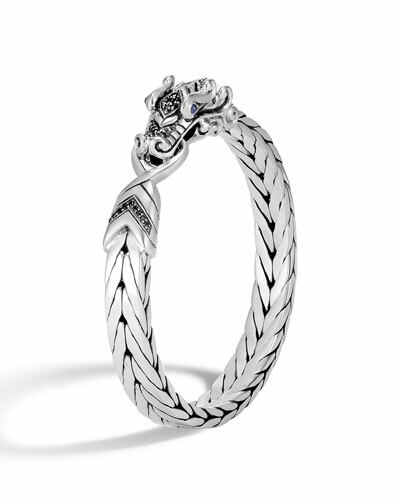 Naga dragon motif with diamond accents. Two round blue sapphires as eyes. 0.17 total diamond carat weight. Puller clasp. Handcrafted in Thailand. John Hardy Legends Naga Bracelet w/ Diamonds, Size L Details John Hardy bracelet from the Naga Collection. Signature sterling hardware with woven chain. Naga dragon motif with diamond accents. Two round blue sapphires as eyes. 0.17 total diamond carat weight. Puller clasp. Handcrafted in Thailand. More Details John Hardy Men's Legends Naga Bracelet w/ Nylon Cord Details John Hardy men's bracelet from the Legends Collection. 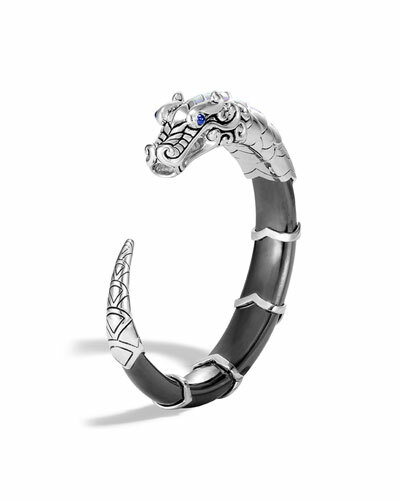 Sterling silver and black rhodium form Naga dragon. Two round blue sapphire eyes in bezel settings. Double wrap black nylon cord with bronze ring. Approx. 0.2"W. Handcrafted in Bali. 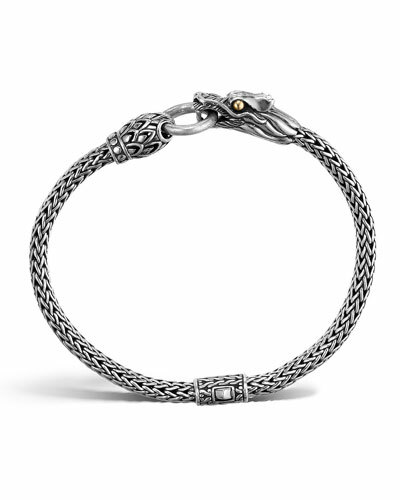 John Hardy Men's Legends Naga Bracelet w/ Nylon Cord Details John Hardy men's bracelet from the Legends Collection. 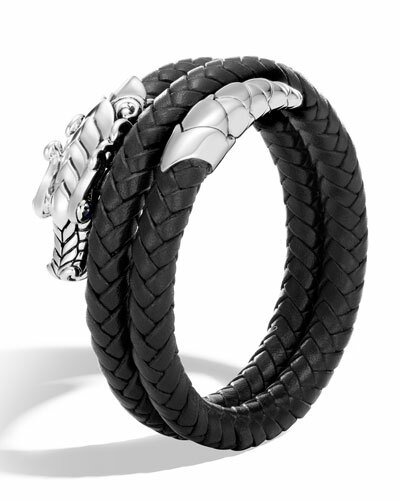 Sterling silver and black rhodium form Naga dragon. Two round blue sapphire eyes in bezel settings. Double wrap black nylon cord with bronze ring. Approx. 0.2"W. Handcrafted in Bali. More Details John Hardy Men's Legends Naga Silver Bracelet w/ Leather Details John Hardy men's bracelet from the Legends Collection. Sterling silver and black rhodium form Naga dragon. Two round blue sapphire eyes in bezel settings. Woven black leather double-strand frame. Approx. 0.2"W. Handcrafted in Bali. John Hardy Men's Legends Naga Silver Bracelet w/ Leather Details John Hardy men's bracelet from the Legends Collection. 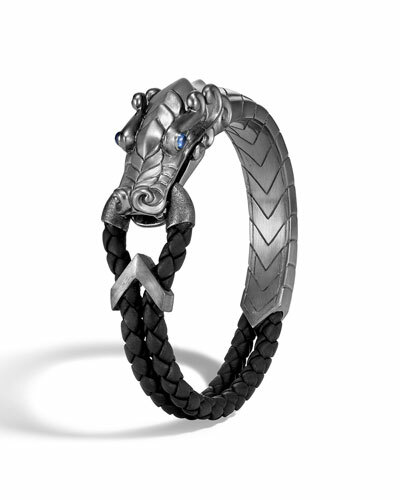 Sterling silver and black rhodium form Naga dragon. Two round blue sapphire eyes in bezel settings. Woven black leather double-strand frame. Approx. 0.2"W. Handcrafted in Bali. 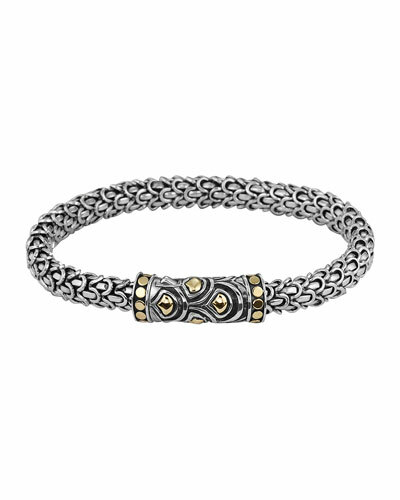 More Details John Hardy Men's Legends Naga Extra-Large Bracelet w/ 18k Gold Details John Hardy men's bracelet from the Legends Collection. Sterling silver and 18-karat yellow gold form Naga dragon. Black rhodium and two round blue sapphires as eyes. Approx. 0.6"W. Handcrafted in Bali. John Hardy Men's Legends Naga Extra-Large Bracelet w/ 18k Gold Details John Hardy men's bracelet from the Legends Collection. Sterling silver and 18-karat yellow gold form Naga dragon. Black rhodium and two round blue sapphires as eyes. Approx. 0.6"W. Handcrafted in Bali. More Details John Hardy Men's Legends Naga Medium Bracelet w/ 18k Gold Details John Hardy men's bracelet from the Legends Collection. Sterling silver and 18-karat yellow gold form Naga dragon. Black rhodium and two round blue sapphires as eyes. Approx. 0.4"W. Handcrafted in Bali. John Hardy Men's Legends Naga Medium Bracelet w/ 18k Gold Details John Hardy men's bracelet from the Legends Collection. Sterling silver and 18-karat yellow gold form Naga dragon. Black rhodium and two round blue sapphires as eyes. Approx. 0.4"W. Handcrafted in Bali. More Details John Hardy Naga 18k Gold Station Bracelet w/ Diamonds, Size M Details John Hardy bracelet from the Naga Collection. Polished 18-karat yellow gold hardware. 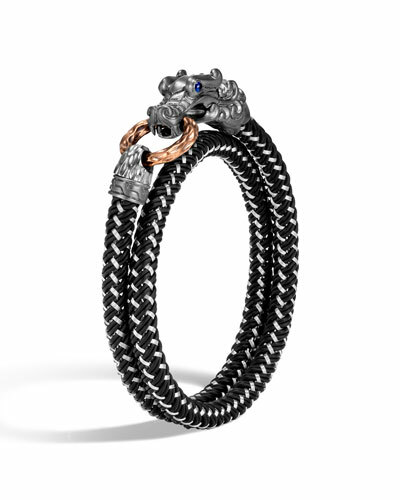 Naga dragons with diamond pavé ring. Round-cut blue sapphires as eyes. 0.07 total diamond carat weight. Lobster clasp. Handcrafted in Thailand. 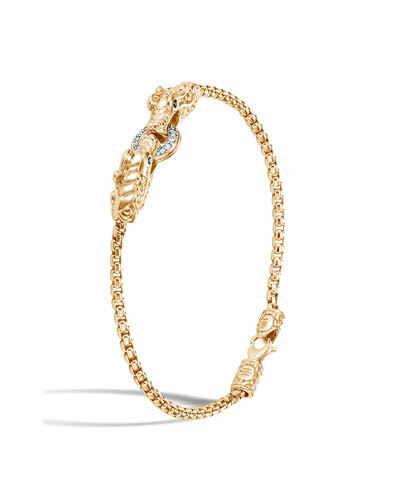 John Hardy Naga 18k Gold Station Bracelet w/ Diamonds, Size M Details John Hardy bracelet from the Naga Collection. Polished 18-karat yellow gold hardware. 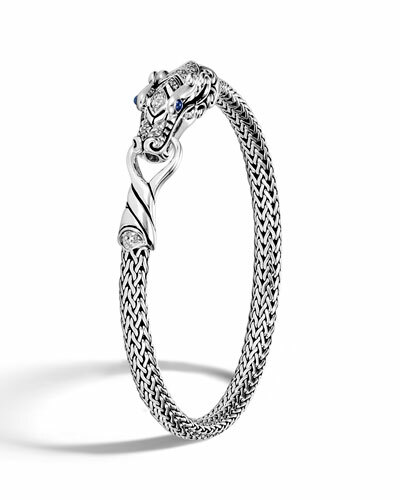 Naga dragons with diamond pavé ring. Round-cut blue sapphires as eyes. 0.07 total diamond carat weight. Lobster clasp. Handcrafted in Thailand. More Details John Hardy Men's Legends Naga Silver Medium Bracelet w/ Black Sapphire Pave Details John Hardy men's bracelet from the Legends Collection. 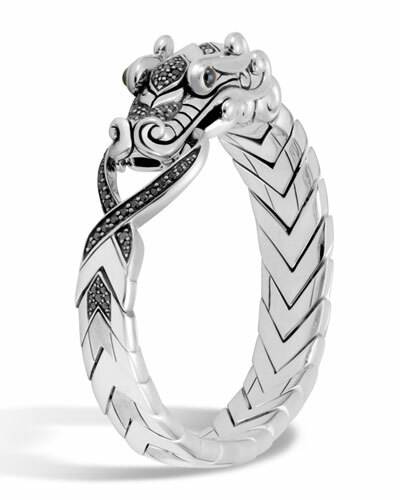 Signature sterling silver forms Naga water dragon motif. Black sapphire and spinel pavé dragon head and tail. Two round blue sapphire eyes in bezel settings. Approx. 0.4"W. Handcrafted in Bali. 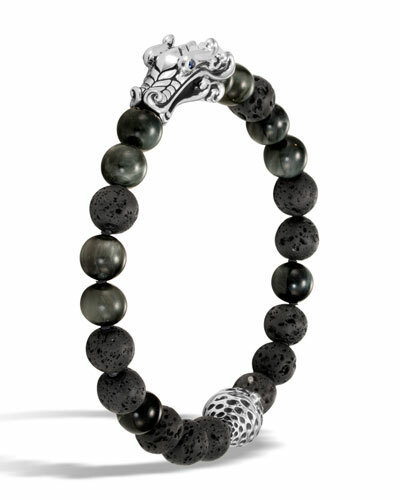 John Hardy Men's Legends Naga Silver Medium Bracelet w/ Black Sapphire Pave Details John Hardy men's bracelet from the Legends Collection. 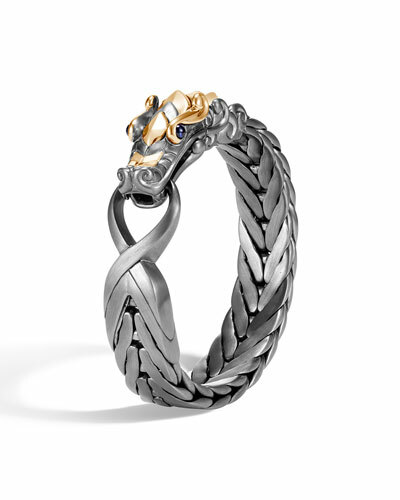 Signature sterling silver forms Naga water dragon motif. Black sapphire and spinel pavé dragon head and tail. Two round blue sapphire eyes in bezel settings. Approx. 0.4"W. Handcrafted in Bali. More Details John Hardy Legends Naga Leather Bracelet Details John Hardy bracelet from the Naga Collection. Signature sterling silver with woven leather band. Naga water dragon head and tail end caps. 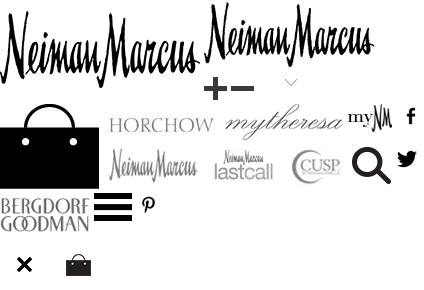 Push-lock closure. Handcrafted in Bali. John Hardy Legends Naga Leather Bracelet Details John Hardy bracelet from the Naga Collection. Signature sterling silver with woven leather band. Naga water dragon head and tail end caps. Push-lock closure. Handcrafted in Bali. More Details John Hardy Legends Naga Double Coil Leather Bracelet, Size S-M Details John Hardy Naga bracelet from the Naga Collection. Signature sterling silver with braided black leather. Coiled leather with dragon head and tail end caps. Two round blue sapphires as eyes. Wraparound style. Approx. 0.3"W. Handcrafted in Bali. 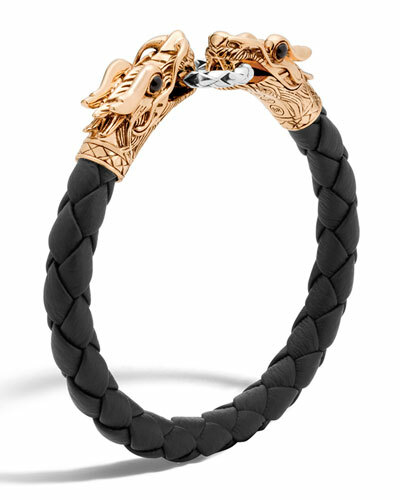 John Hardy Legends Naga Double Coil Leather Bracelet, Size S-M Details John Hardy Naga bracelet from the Naga Collection. Signature sterling silver with braided black leather. Coiled leather with dragon head and tail end caps. Two round blue sapphires as eyes. Wraparound style. Approx. 0.3"W. Handcrafted in Bali. More Details John Hardy Men's Legends Naga Silver Bracelet with Blue Sapphire Eyes (16x6mm) Details John Hardy men's bracelet from the Legends Collection. 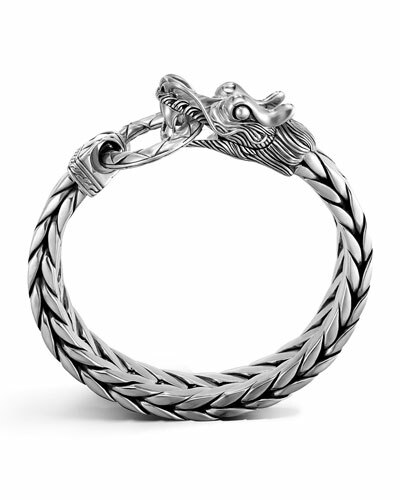 Signature sterling silver forms Naga water dragon motif. Two round blue sapphire eyes in bezel settings. Handcrafted in Bali. John Hardy Men's Legends Naga Silver Bracelet with Blue Sapphire Eyes (16x6mm) Details John Hardy men's bracelet from the Legends Collection. 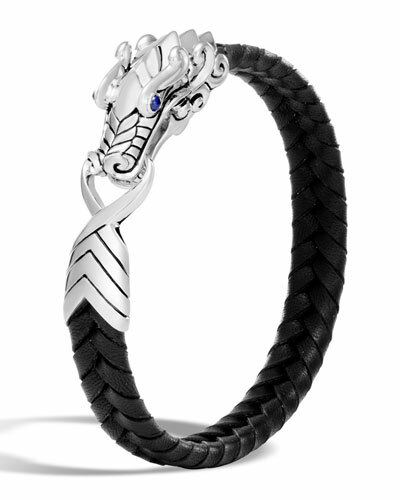 Signature sterling silver forms Naga water dragon motif. Two round blue sapphire eyes in bezel settings. Handcrafted in Bali. 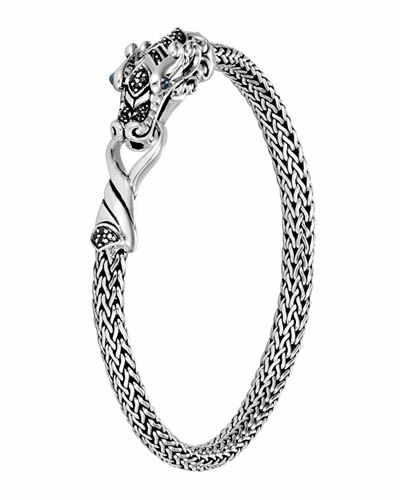 More Details John Hardy Naga Chain Bracelet, Medium Details From the Naga Collection. Sterling silver dragon-scale motif. Center station features oversized scale pattern and 18-karat gold accents. Bracelet measures 6mm wide. Station measures 24mm wide. Handcrafted in Bali. 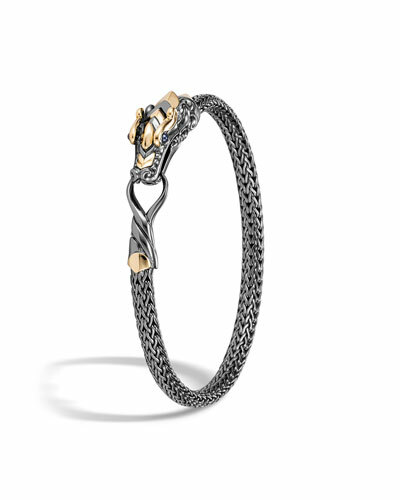 John Hardy Naga Chain Bracelet, Medium Details From the Naga Collection. Sterling silver dragon-scale motif. Center station features oversized scale pattern and 18-karat gold accents. Bracelet measures 6mm wide. Station measures 24mm wide. Handcrafted in Bali. More Details John Hardy Legends Naga Hematite Kick Cuff, Medium Details John Hardy bracelet from the Legends Collection. Sterling silver hardware with Naga dragon motif. Tapered hematite frame with split opening. Two round blue sapphires as dragon eyes. Approx. 12mm wide. Slip-on style. John Hardy Legends Naga Hematite Kick Cuff, Medium Details John Hardy bracelet from the Legends Collection. Sterling silver hardware with Naga dragon motif. Tapered hematite frame with split opening. Two round blue sapphires as dragon eyes. Approx. 12mm wide. Slip-on style. More Details John Hardy Men's Legends Sapphire Bracelet Details John Hardy men's bracelet from the Legends Collection. 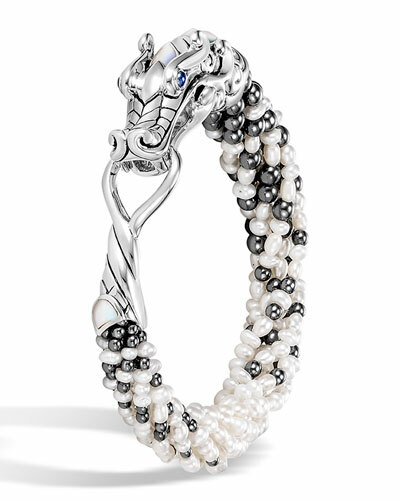 Signature sterling silver forms Naga, water dragon. Naga silhouette with blue sapphire eyes. Handcrafted in Thailand. John Hardy Men's Legends Sapphire Bracelet Details John Hardy men's bracelet from the Legends Collection. 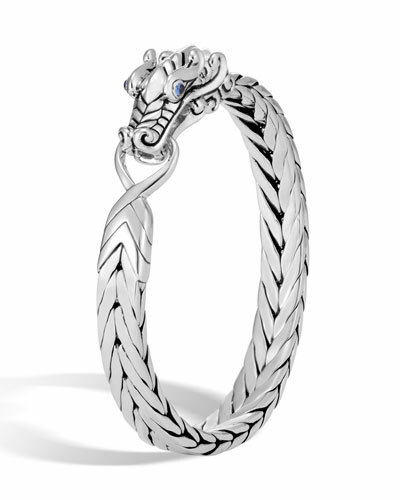 Signature sterling silver forms Naga, water dragon. Naga silhouette with blue sapphire eyes. Handcrafted in Thailand.